The Sylvania Wilderness, because it contains one of only two large remnants of virgin forest in the Great Lakes region, serves as a unique laboratory for asking questions about the pre-European settlement environment. A number of educational/research and government institutions have, therefore, conducted field work there. This work involved taking pollen cores from bogs and lakes to study past vegetation patterns, establishing vegetation plots (some of which are surveyed once and others repeatedly) to study current vegetation patterns and short-term changes, digging pits and collecting samples from soil horizons (layers) to study soil profiles, and coring trees to study their rings. The following are a few specific examples of how scientists have used Sylvania to answer life-science questions. Taking cores from lakes or bogs that contain pollen are the most widely used tool in the study of vegetation patterns and their changes over time. Pollen, emitted by many plants, are tiny grains that are easily dispersed by the wind or by insects. They can be identified under a microscope by their distinct shapes and sizes, and they are preserved almost indefinitely if deposited in an environment lacking oxygen, such as the bottom of a lake or bog. The part of the “pollen rain” generated by the surrounding vegetation that falls onto a lake surface will sink to the bottom and become buried by subsequent deposits of pollen and sand. Over time, a thick layer forms from which a core may be taken. The pollen composition in the top of the core would represent the composition of the present vegetation while that at the bottom of the core would, in the case of a previously glaciated area, represent the time of the retreat of the ice. While changes in the composition of the fossil pollen represent changes in the composition of the surrounding vegetation, the translation is not simple because of differences in pollen productivity and dispersal rates between different species. For example, dispersal by wind is a function of grain size; the smaller and lighter grains fall further from their source. Consequently, the composition of the pollen deposited in a small bog or hollow reflects the vegetation in the immediate vicinity, while that deposited in a large lake (where the water mixes the grains before they are deposited at the bottom) represents the regional vegetation pattern. Most studies of fossil pollen focus on changes in regional vegetation patterns that reflect changes in climate; they therefore core large lakes. However, to understand the formation and maintenance of Sylvania’s patchy forest, it is necessary to core a large number of very small hollows in the forest floor that remain damp year-round to preserve the pollen (Davis et al. 1998). Since trees produce a new ring every year, the number of rings may be used to determine the age of a tree and the age distribution of the trees within a forest stand. Variations in ring width are also useful: They may be used to study climate variations as well as disturbance patterns within a forest (Frelich and Graumlich 1994, Parshall 1995). Narrow rings are a tree’s response to stress while wide rings reflect optimum conditions. A ring for a particular year that is unusually wide in all trees within a stand reflects optimum climate conditions (usually warm and/or wet). A wide ring in only a few trees reflects the formation of a gap in the forest. For example, if several tall trees are blown down by a storm, the trees that had been growing in the understory will suddenly have increased access to sunlight and nutrients and will produce a wider ring. This is referred to as “release from suppression.” By coring trees and looking for such release from suppression patterns (a sudden increase in ring width), one can study the frequency and size of disturbances as well as the response of the forest to them. Extremely wide early rings, for example, imply that the tree had not been an understory tree but had sprouted in the gap. By comparing ring width for different species, one can say something about which responds more quickly to a gap. By comparing the gap record to the climate record, one can say something about the role climate (including drought) plays in the formation of gaps. Such studies have shown that gaps forming within a tree patch in Sylvania will eventually be filled with the same tree species because of the positive neighborhood effect. Information on pre-European settlement vegetation patterns is needed to understand the human impact on the landscape. A potential source of such information is the U.S. General Land Office Public Land Survey (PLS). This survey was conducted between 1785 and 1910 for the purpose of dividing the land between Ohio and the west coast into parcels that could then be put up for sale. At the corner of each section, quarter, and meander (water body) the surveyors noted the species and diameter of two to four nearby trees, known as bearing or witness trees. This data has been used in a number of reconstructions of past vegetation patterns but it is relatively coarse; the distance between corners is half a mile. Manies and Mladenoff (2000) began working on a method of interpolation. They surveyed the pre-European settlement-like Sylvania Wilderness using the PLS method which provided them with witness trees while aerial photographs provided the complete coverage. This permitted them to develop a computer model that interpolated between the witness tree data and to compare the simulated vegetation pattern to the “observed.” Such a model, once perfected, could be used to reconstruct pre-European settlement vegetation patterns for areas now disturbed by human activities. Dr. Frelich, Director of the University of Minnesota's Center for Hardwood Ecology, and his team are maintaining four research plots within the Sylvania Wilderness. For each of the 20,000 trees located within these plots, a record is being kept of their location and changing diameter, and a note is made of their demise. 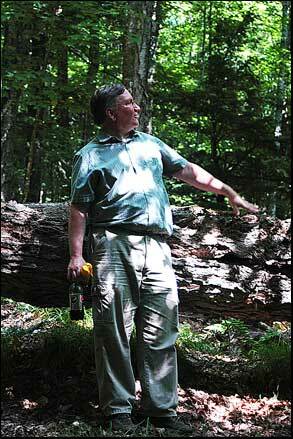 Dr. Frelich and his team have been doing this for two decades in order to better understand forest dynamics. The Ottawa National Forest requests that anyone wishing to conduct research in Sylvania contact Michelle Holland at the Watersmeet Ranger District (mholland(at)fs.fed.us., 906.358-4551 ext. 21). Many research projects require a permit. Furthermore, the Forest Service needs to be aware of projects to facilitate their management, assist the researcher in plot location, etc.